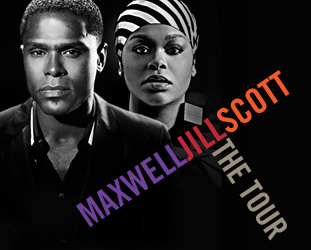 Maxwell and Jill Scott Giveaway Right Now!!! Hey guys Jerm here with today&apos;s giveaway! You just never know when we are gonna have tickets to amazing events like when we have two Grammy award winning artists on display at the St. Pete Times Forum! If you didn&apos;t catch my post yesterday, once again shame on you for not checking with us on a regular basis, and here is the deal! I have two sets of 4 tickets to give away today for the Maxwell and Jill Scott concert tonight at the St. Pete Times Forum at 7pm! Nice huh! Here is a refresher on the way the giveaway will work. Instead of re-tweeting like I used to make you do, just answer the question on Twitter and Facebook. Once you do that you will be entered in to win, as we will randomly draw. For those of you playing on Twitter and who choose to re-tweet, it does indeed increase your chances of winning. We all know him by his mononym "Maxwell," but what is his full given name? A two time Grammy award winning artist, Jill Scott was awarded the her first Grammy award in 2005 when she won the for "Best Urban/Alternative R&B Performance." Name the song/performance for which she won that award. Okay guys, those are pretty easy ones, so be sure to play along and you will have a chance to see these two tremendous performers live tonight at the St. Pete Times Forum. If you are playing on Twitter, just reply to us with the answer, and if you are on Facebook, just reply to the post link thread with your answer! Stay tuned in for more fun giveaways and Tampa Bay area events, and things to do in Tampa Bay!